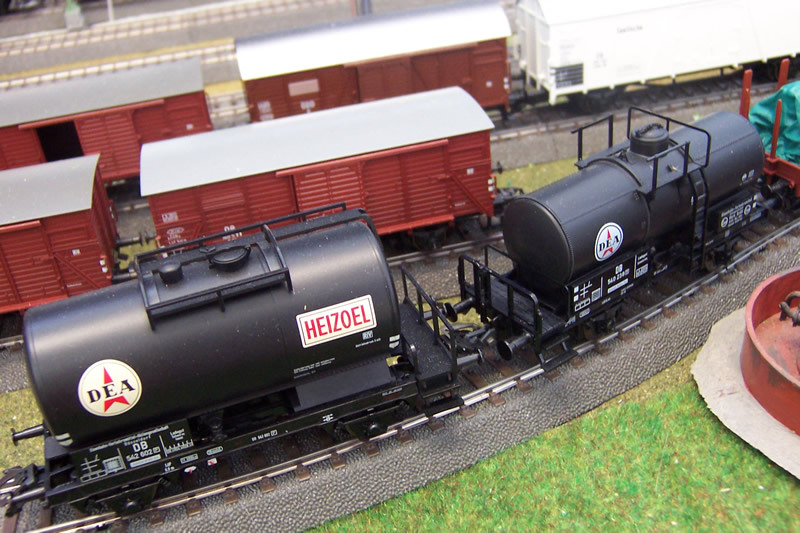 Railway Oil and Liquids Tanks, and the models. Tanks were used for both industrial and edible oils, and liquids of all types. Petroleum companies carried their products for roadside and for industrial use, and used tank side branding for promotional purposes. The most well known roadside brands in Europe were Aral, BP, Caltex, Esso, Mobil, Shell, Texaco and Total. However many smaller companies existed, each with rich histories. Many owners of tank car fleets carried petroleum and edible oil products on the railways, and often did not carry particular branding, though some did when in constant use for a particular client. Deutsche Tiefbohr AG was incorporated in 1899 and twelve years later became Deutsche Erdöl AG (DEA). Products were initially sold through Olex, which was acquired in stages by BP from DEA in the 1920s.After the war of 1939-45, DEA became an independent refiner and marketer (under the DEA brand from 1952 onwards) in West Germany. Unusually, as a late entrant to the market, it allowed a number of independent distributors (jobbers) to resell fuel under its name. DEA also supplied a few sites in Switzerland and Austria. In 1966 it was acquired by Deutsche Texaco AG and the name was soon phased out. Photo below is two tanks belonging to the DEA, both running in the early 50's. The larger one is from the Maerklin set 48810. The camera has failed to capture the subtle cream colouring used as a background in both DEA and HEIZOEL logos. The smaller tank is from the Fleischmann set 94 5802 and the logo background is a distinctly whiter colour. I would presume that, knowing the research faciliies available to Maerklin, they have the colouring correct. The tanks are being shunted appropriately near a Kibri oil distribution model. Rheinpreussen was an independent German refiner that was established in 1905 and controlled by the Haniel family until acquired in two stages by DEA (1959 and 1965). Part of the company history shows that in 1935 it was proven that it was possible to produce petrol from coal. A year later Rheinpreußen GmbH started to found the coal mine of the same name in Meerbeck and produce synthetic petrol. This petrol was then sold by a network of petrol stations. On the 4th October 1936, the first tank wagon was loaded with synthetic Rheinpreußen petrol. Rheinpreußen petrol could be purchased until 1959. Brawa model number 67050 is a distinctive short four axle tank. This type of tank would have been used for heavy oils with high specific gravity, to spread the load so as not to exceed the axle loading for railway lines. The small tank is from a Trix set 23950. This tank is from theTrix set 23950- it included the small tank shown above. It is the same model as the Shell tank.